Four Liebherr luffing jib cranes are currently operating in Baku (Azerbaijan). 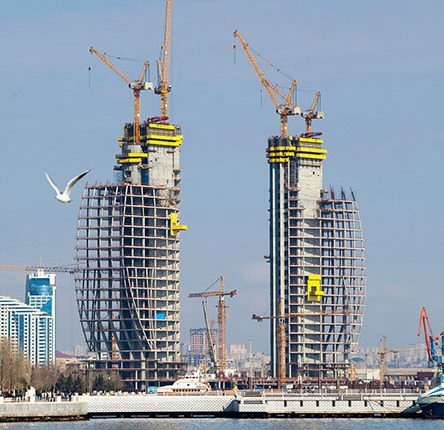 Since the beginning of 2015 an architectural landmark has been under construction in the capital of Azerbaijan, the urban development project known as “The Crescent Bay”. The project was designed by South Korean architecture agency “Heerim Architects & Planners” and comprises three parts, the Crescent Hotel, the Crescent City and the Crescent Place. The “La Luna” luxury hotel is to be built on a small artificial island and will reach 166 m up into the air. Based on the half-moon on the flag of Azerbaijan, the hotel will be shaped like a vertical sickle open at the bottom. Next to the luxury hotel, “The Crescent Bay” will be a shopping centre covering an area of around 50,000m² with an indoor and outdoor area, a modern residential complex with 100 apartments and 20 duplex terraced houses as well as an innovative office building with 38 storeys.